I have been trying to deny it for a while, but I am sad to admit it, we have mice. Not just one or two, I'm pretty darn sure there's a small family living at my house. I've got my food pretty well packed up in the kitchen and now I'm on a mission! I'm going room by room scrubbing out, cleaning out and emptying every darn cabinet, nook and cranny I can get my hands on. 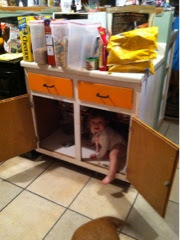 This was what Lissy did when I got the whole cabinet emptied! Right now I have a HUGE volume of little people clothes that I am prepared to get rid of. I wish there was a consignment sale right now. I will probably post a few things on ebay and I'll be sure to post links to the listings here, just in case anyone is interested. Geoff is all concerned about the fact that the mice are mammals. I call BS. I threw a mom and her babies in the trash about a week ago and I know there are more in my home. I want them all gone! He won't let me use traps or bait to kill these things. I'm not worried about using them in controlled places; cabinets, behind cabinets, etc. But such it is. My winter break plans include creating countertops and nailing or screwing those darn suckers down onto the cabinets so that mice can't get in or out (and my counters look cool), finishing the trim for the half-wall in the kitchen, getting vent covers put on all the air vents in the dining room and kitchen and getting rid of as much extra stuff that is in our house as is humanly possible. I'm hoping if I do all of these things that maybe the mice will get the idea that they are not welcome and will leave on their own. Either way, there is too much stuff in my house and I want to get it gone!